and those who say it are implying that needlessly hurting and killing animals at a rate of thousands per second is completely acceptable providing someone who chooses not to support these actions would, given no other option, eat an animal to avoid starving death. In reality it's simply an avoidance tactic with no real meaning at all, an attempt to 'trip up' a vegan and somehow try and show that they actually have no problem killing animals. 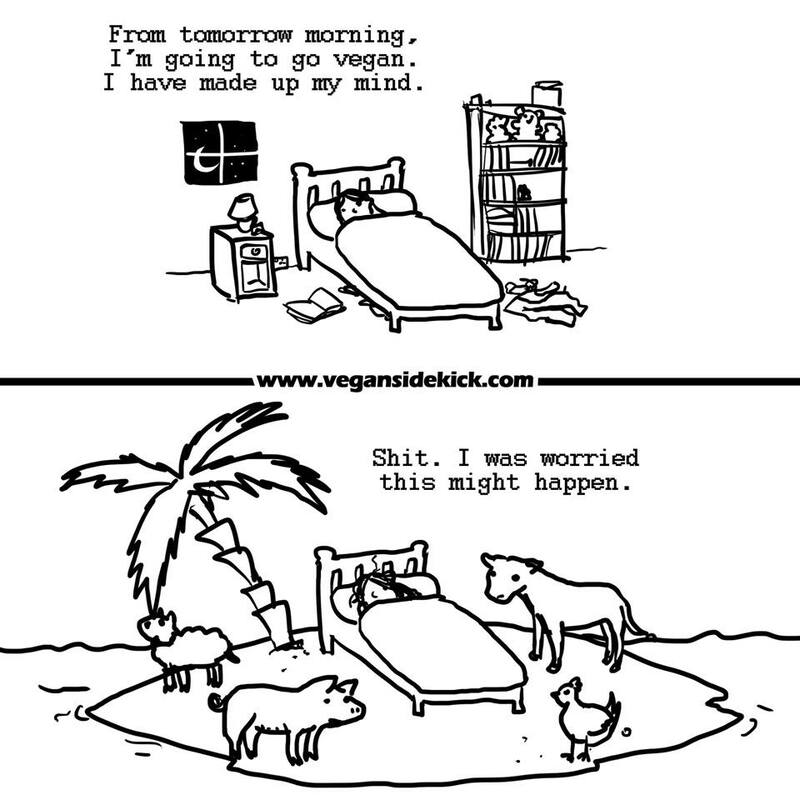 Even if we ignore for a moment that most vegans would just eat the same plants these island dwelling animals are eating, or that they would undoubtedly lack the skills to successfully kill, gut and prepare an animal anyway, this argument is pointless because none of us are stranded (or likely to get stranded) on a desert island. I think the desert island argument also stems from the mistaken idea that vegansim is some kind of moral state of perfection, rather than just an honest attempt to do the least harm possible. I'm sure some vegans would indeed kill and eat an animal if (and only if) it was their only means of survival. After all, there are people who have eaten the flesh of their own dead friends to survive similar situations even though I'm sure they would have said beforehand they could never do such a thing. A similar example is whether or not a vegan with a gun would shoot a bear that was trying to kill them. I'm sure in most cases that whilst being sad about the consequences, they wouldn't hesitate to kill a bear in order to save their own life. This is because killing to survive (in spectacularly rare, almost non-existent life-or-death situations) is obviously not the same as making daily avoidable choices that support the cruelty and the death of billions - choices made solely because we like the taste of a particular animal's flesh or secretions. Each of us is incredibly lucky to have the lives that we do, and none of us are stranded on desert islands or lost in jungles. We live in a modern world of almost endless choice. It's important that we make those choices matter. and people like to think something humane happens along the way."